Dates: SAT 3RD NOV - SUN 4TH NOV2012, 9.30am – 5pm, with a break for shared vegetarian lunch. Note: Still places are available and feel free to contact us for booking at info@irishsanghatrust.ie or 087 2877837. To book a place please click 'Register' button below. Registration Fee: €20 for one day, €30 for 2 days. Concession for children is €10. Please contact us if you wish to bring your child/ren along. Please specify the date that you wish to attend on the online booking form, if you wish to attend only one date. It is recommended to attend both days. 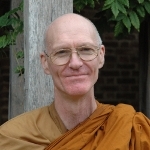 Ajahn Dhammanando grew up in Carshalton, Surrey, a fairly typical suburb of South London. He attended Mitcham Grammar school and went on to study English and History at Keele University in Staffordshire at a time when the curriculum there was broad and multi-disciplinary. He was aware of certain deep questions, barely articulated, on the inside, however he did not pursue a spiritual quest to find answers as the religions which he encountered in the UK appeared to him only marginally relevant. It was after graduation on going to Thailand as a volunteer teacher for VSO that he found some initial signposts, although at that time he had almost no understanding of Buddhism. In 1985 he took a year off work in order to spend time as an Anag?rika in Amaravati and Chithurst monasteries. Four and a half years ensued during which he studied for an MA at Essex University, among other things. The realisation gradually dawned that Going Forth was what he really needed to do and that his more worldly interests were of lesser importance. In 1991 he returned to Amaravati to re-ordain as an Anag?rika.